I'm a huge watch fanatic and this watch is so original and unlike any of my others! I love it!! I bought it in silver as well and it came missing a stone so beware of that but it's a beautiful piece to add to your collection of watches! 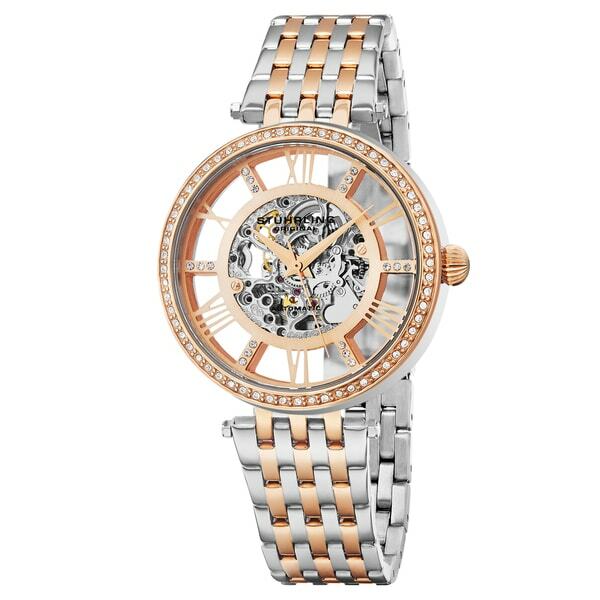 Fully skeletonized, automatic mechanical movement, and a Swarovski crystal elementsfilled bezel come effortlessly together to form the mesmerizing Delphi watch. Beautiful watch. The problem was, it was absolutely huge and bulky. It said it was a woman's watch but I would not agree. The face is as big as any men's watch I've seen. I sadly had to return it!! Had to pay all postage for the return to Utah even though it was shipped to my home in Canada, from Canada where I live, just a 1/2 hour drive from here!! Not happy.